Click the Locations command on the Tools menu. Click the "..." button in the Location field of the Event Editor or Event Defaults tab of the Calendar Properties window. Double-click a location name on the Locations tab of the Calendar Items area of the main window, or right-click the location name and select the "Location Properties" command. 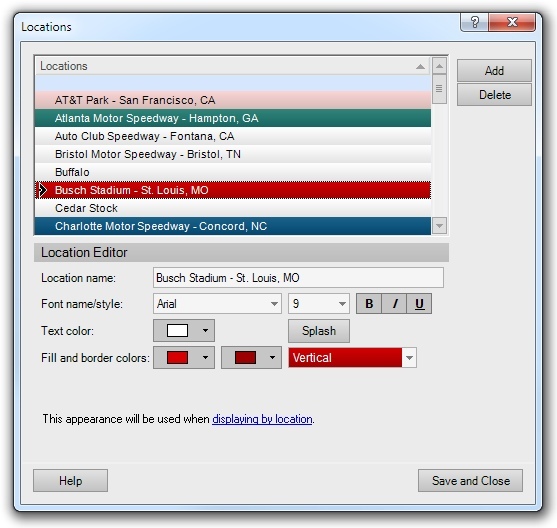 Each event can be optionally assigned a location in the Event Editor. The list of available locations can be modified via the Location Editor. New locations can be added and existing locations renamed or deleted. Also, event locations can be assigned a color, and events will be displayed with the associated location colors when the Locations tab in the Calendar Items List is active, or when the "Color Events Using" option in the View menu is set to show location colors. This window can be accessed by clicking the "..." button in the Location input field on the Event Editor window. It can also be accessed from the Tools menu. The location list shows all the currently used/defined event location names. By default, event locations will be colored white and gray. Appearances can be assigned to locations to help differentiate them, or draw attention to events occurring at a certain location, when the Calendar View is configured to show event colors based on location. A location can be added by clicking the "Add" button. A new location will be inserted in the list and the "Location name" field activated to enable naming of the new location. If the specified name is already used for another location, a message will be displayed. To delete a location, click its name in the list and then click the Delete button. If the deleted location is associated with any events, the association will be removed. An existing location can be renamed or its appearance changed. To do this, click the location in the list. Next, enter the new location name or desired appearance using the appearance editor. When renaming a location, all events occurring at the previous location name will be updated to occur at the new location name.